A year ago, if you wanted to purchase and download music without digital rights management—aka DRM, the protection scheme that controls what you can do with your digital media—your choices were few and far between. Some small outfits, such as eMusic, sold DRM-free music, though not usually from the major labels. And while other services, such as Yahoo Music, had toyed with DRM-free releases, it was only for limited promotions. But the vast majority of digital music available online, from vendors like Apple, Microsoft, and Napster, used some form of DRM to protect its content. Then, in February 2007, Apple CEO Steve Jobs wrote a lengthy and seemingly unprovoked essay on the subject of DRM, entitled “Thoughts on Music.” In the piece, Jobs said that Apple would adopt an entirely DRM-free catalog “in a heartbeat,” presuming the four major record labels—Universal, Warner Music, Sony BMG, and EMI—would let Apple do so. Jobs argued that DRM had never been effective at combatting piracy, given the fact that all music sold on CDs was essentially unprotected, and even those digital schemes that did exist had loopholes: Apple itself had for years allowed its iTunes customers to strip the DRM from their purchased music by burning files to CD and then re-importing them. The world Jobs laid out, where all music sold by online stores would be completely interoperable and DRM-free, seemed to many to be a future seen through rose-colored glasses. Six weeks later, however, it went from fiction to fact when Apple announced a deal with EMI to distribute DRM-free tracks on the iTunes Store. The initiative, dubbed iTunes Plus, would see EMI’s entire catalog made available on the iTunes Store without DRM, in a higher-quality audio format for a premium of 30 cents more than the usual 99-cent track price. The ever-ambitious Jobs predicted that by the end of 2007, half of iTunes’ catalog would be available without DRM, a move that would necessitate deals with the other major record labels. Apple never reached that milestone, however. So what happened? In order for Apple to pass that vaunted halfway point, it would have needed to get one of the other big music companies on the DRM-free train. The labels, however, had long been uncomfortable with the amount of power Apple wielded, such as insisting on the flat 99-cent price per song. And with Apple as the runaway leader in the digital download market—and increasingly in the music market as a whole—the labels had little in the way to use as leverage. Meanwhile, competing music stores had been engaged in an uphill battle against iTunes. Much of that success can be attributed to iTunes’s close ties to the iPod, which remains to date the most popular digital music player on the market; as of December 2007, it held a 67 percent market share. Of course, iPod owners have never been limited to getting their music from the iTunes Store—CD ripping has always been possible—but all of iTunes’ rivals used DRM schemes that were incompatible with Apple’s portable player. The labels saw an opportunity with DRM-free music, which they thought would allow them to tip the balance of power back into their favor by freeing them from Apple’s stranglehold on the digital download market. Since DRM-free music can be played on the iPod without any sort of technological tomfoolery, providing those tracks to other providers would open up Apple to competition—and the record labels were in a position to make that happen. In August 2007, Wal-Mart and Real Networks announced support for DRM-free music, both prominently featuring DRM-free tracks from Universal Music Group. 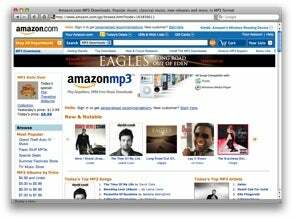 Amazon MP3 offers DRM-free tracks from all the major labels. The cannonball into the pool of the digital music download market came in September 2007 when retail giant Amazon launched its own long-awaited music download service, featuring an entire DRM-free music catalog from both EMI and Universal Music Group, as well as a number of smaller independent labels. By leveraging its enormous existing customer database, distributing a free program that tied into Apple’s iTunes music software, and undercutting the pricing on iTunes’s DRM-free offerings, Amazon positioned itself as the first major competitor to iTunes. Meanwhile, iTunes rivals have picked up momentum on the DRM-free front. Earlier this year, Amazon picked up the other two big record companies, Sony BMG and Warner Music Group, making it the first digital music site to boast DRM-free tracks from all the major labels and boosting its total catalog to 5.2 million songs. Just this past week, former music-sharing site Napster reinvented itself by launching an all DRM-free service and claiming the crown of largest MP3 catalog around with over six million songs. And in April 2008, Sony, Universal, and Warner also announced deals to distribute DRM-free tracks on News Corp.’s popular social-networking site, MySpace. But for all that they appear to have embraced DRM-free music, Sony, Universal, and Warner continue to withhold the unencumbered tracks from Apple, choosing instead to back iTunes’s rivals. It would seem that Steve Jobs’s proposed future of DRM-free music has quickly become a reality—if not in quite the way he envisioned.